For Australian solar households looking to distance themselves from the mains grid, the competitively-priced Sunny Home Manager Flexible Storage System is worth considering. 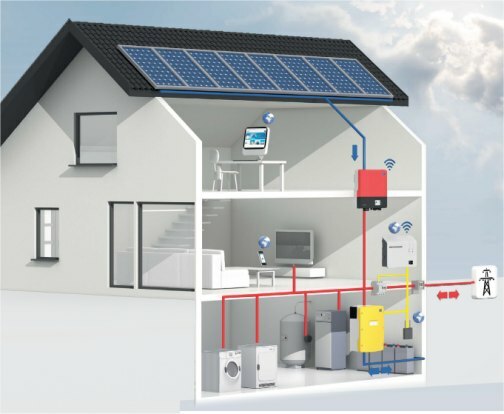 Whether the ultimate goal is to completely ditch the grid or still maintain a mains connection; this clever system from SMA is up to the task. The system has been developed to enable households to store surplus electricity generated by their solar panel array for use when the sun isn’t shining or in blackout conditions. It consists of a Sunny Island battery inverter, a Speedwire Data Module, SMA Energy Meter and Sunny Home Manager. Available from national solar provider Energy Matters; it’s an open concept that works with most battery technologies (including lithium-ion) and any existing grid connect inverter. This degree of flexibility allows Energy Matters to package an entire energy storage solution, including batteries, according to a customer’s needs and circumstances. In the image above, the solar inverter converts the DC current produced by the solar panels to AC power for household use. Any power not being used by household appliances is transmitted to the Sunny Island. The Sunny Island charges the batteries and also offers an uninterruptible, grid-quality power supply. Power not being utilised by either the household or Sunny Island is exported to the mains grid. At night, or when called upon, the Sunny Island converts the DC energy stored in the batteries back into AC power for use by the household. The SMA Energy Meter communicates solar generation and consumption data via Speedwire to the Sunny Home Manager. The Sunny Home Manager provides live data on electricity use to aid in smart energy management. Reports and visualisations of all the relevant electricity flows are displayed via a user-friendly interface, providing comprehensive and concise data. Reports and data generated by the Sunny Home manager can be accessed on a PC or smartphone. Unlike some grid-connected energy storage solutions, if a mains-grid blackout is experienced; the system doesn’t shut down – it will automatically switch to using the energy stored in the battery bank. The SMA flexible storage solution is also “future-proof” – it will be compatible with future smart grid technologies. For pricing and related enquiries, contact the Energy Matters team on 133-SUN or via sales@energymatters.com.au.